A pun is a joke that makes a play on words, typically by using words that sound similar but have different meanings. It can also use different meanings of the same word to make the saying funny. While some puns will likely only be understood by adults, funny puns for kids a great way for young ones to learn how to play with language too. Perhaps the oldest joke formula of all-time is one when you pose a rhetorical question where the answer is a clever pun. Here are some great examples. What do you get when you cross a snake and a pie? A pie-thon! What was the reporter doing at the ice cream shop? Getting the scoop! What do baseball players eat on? Home plates! Why did the turkey cross the road? To prove he wasn't chicken! What did the judge say when the skunk walked into the court room? Odor in the court! How do you fix a broken tomato? With tomato paste. Why did the lion spit out the clown? Because he tasted funny! What's purple and 5000 miles long? The Grape Wall of China! What do you call a knight who is afraid to fight? Sir Render. Funny animal puns always go over well with children. A skunk fell in the river and stank to the bottom. The chicken crossed the playground to get to the other slide. The marine biology seminars weren't for entertainment, but were created for educational porpoises. When you're ready to dig into more jokes that lean on clever wordplay, there are still plenty of laughs to be enjoyed. Take a look at these examples of puns for inspiration, and then check out puns in literature to see more from some of the greats. "Examples of Puns for Kids." YourDictionary, n.d. Web. 23 April 2019. 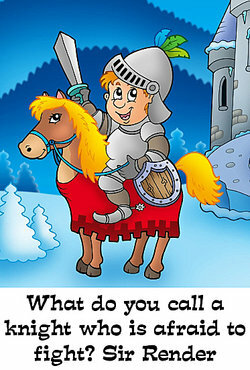 <https://examples.yourdictionary.com/examples-of-puns-for-kids.html>.